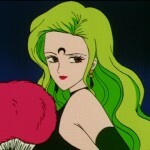 This entry was posted in Sailor Moon Anime (1992) and tagged Black Lady, Hulu, Luna P, Petz, Sailor Moon R, Sailor Moon R episode 85 - The Dark Queen: Birth of Black Lady, Sailor Moon R episode 86 - Saphir Dies: Wiseman’s Trap, Saphir, Wise Man by Adam. Bookmark the permalink. Or did they never reach super form in this timeline? Perhaps everything that happened changed history to the point where they were required to power up beyond star level. Or maybe these are just uniforms they wear when they are not transformed….or even cosplaying as themselves for the party maybe? One thing is for certain, in the original anime you don’t get lips until you grow up! Well, the Super transformations weren’t part of the story yet. 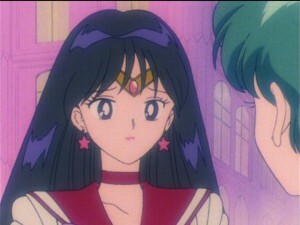 Naoko Takeuchi didn’t even have plans for an arc after the Dark Kingdom until her publisher and Toei urged her to keep the series going. She needed time to come up with another story, which is why we have the Maikaju arc. If she’d known she’d be making three more arcs and having costume transformations in them, maybe she’d have included those changes, but oh well. Hindsight’s 20/20, right? Yep. That’s why I said that the real answer was obvious. 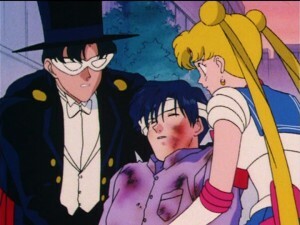 I’m sure everything changed when Sailor Moon and Neo Queen Serenity met in a version of the future. The future has many variations, it can change thru time. 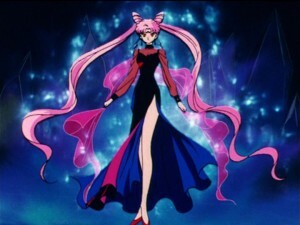 It was never allowed for Sailor Moon to travel to the future, but Chibiusa changed that. More importantly, why don’t the Soldiers remember that them throwing a surprise party will turn Chibi-usa evil and decide to just throw a normal party? 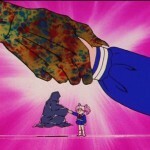 Since Chibi-usa goes back into the past and changes everything, wouldn’t that mean the Soldiers in the future would remember that, thus preventing the need for Chibi-usa to become evil? Time loops confuse me. Let’s start in the 30th century prior to the attack of the Black Moon clan. 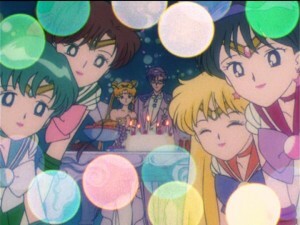 This is a separate timeline of sorts, where the Black Moon clan never appeared before the Sailor Soldiers in the 20th century, therefore the Soldiers wouldn’t have known that a surprise party was a bad way to go (though I doubt that would have made much of a difference, considering who we’re talking about). This explains why the Silver Millennium was caught unawares by the Black Moon clan’s attack, because it never happened to them in this timeline. When the Black Moon clan reared its ugly head, they caused chaos, but at the same time they caused the current timeline to branch off in two directions. This is similar to Dragon Ball Z, where Trunks’ meddling in the past caused a timeline where Cyborgs 17 and 18 have decimated humanity and Trunks defeats them, and a parallel humanity where the cyborgs never try to destroy humanity and the characters live peacefully. 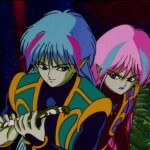 However in this case, the branch-off causes two futures, one in which the Black Moon only appears in the 30th century and is defeated, which is the one Chibiusa keeps returning to, and an alternate 30th century where the Black Moon clan attacked in the 20th century, and the Silver Millennium takes steps to prevent the Black Moon clan from rising. 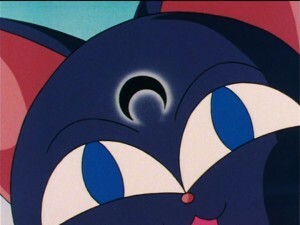 This would mean that when Usagi has Chibiusa though, she has a version different from the one she knew as a teenager, because this version will never go back in time, at least not under the same circumstances as when the Black Moon clan attacked. 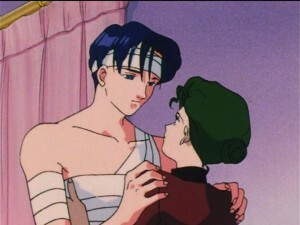 Of course if Chibiusa did go back in time under these circumstances, that would create a third timeline altogether, and Ami would probably eplain all this better than I could, so Usagi and Mamoru would probably just decide to keep the kid at home where she’s safe. 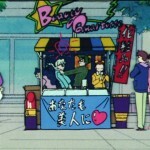 Anyway, I think I’ve explained why Chibiusa keeps having that surprise party. Any questions? When does Homura Akemi show up to show them all how it’s done? 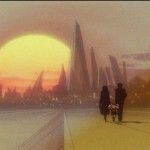 As soon as Lelouch Lamperouge and Mai Tokiha elope, move to Tokyo-III and adopt Ceil Phantomhive, I expect. Furthermore, why do all the women in the future wear really thick lipstick? Fashion trend for villains. Case closed. 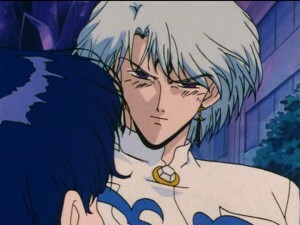 But like even the Soldiers all wear this thick lip stick, even Ami does. They wear lipstick now in Crystal. Maybe it’s just the decision of the animators to distinguish between the girls in middle school and as adults.